The Naxos Book of Carols (SATB). Composed by Antony Pitts. Choir Sacred. For SATB choir (SATB choir). Book; Choral (Sacred); Choral Worship Collection; Worship Resources. Faber Edition. Christmas. Published by Faber Music (AP.12-0571523250).ISBN 0571523250. Christmas.The Naxos Book of Carols is collection of both the very old and the very new. Commissioned by the leading international classical music label, Naxos, these twenty-four arrangements of traditional and original carols tell the Christmas story - from the hope of Advent and the message of the Angels, to the humble birth of the baby in Bethlehem and the coming of the King of kings.This new collaboration between Naxos and Faber Music has brought this volume, containing all 24 carols in four narrative sequences, in new arrangements for SATB choir with minimum divisi. 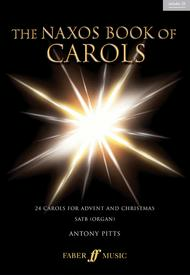 There is a good mix of accompanied and a capella (even the latter have optional accompaniments) and there is practical guidance on how the carols may be used by congregations, as well as choirs with varied resources.The original CD, performed by the award-winning choir Tonus Peregrinus and directed by the composer Antony Pitts, is included within each book making it incredible value for money.